The scene: "R" and the GGB at the GGB's home watching Fox News' coverage of the SOTU and the Democrat response by Virginia Gov. Tim Kaine (D). Brit Hume: "And now we go live to the governor's mansion in Richmond, Virginia." GGB: "Oooh, a fireplace. Looks like he's going to read us a bedtime story." Kaine: "Hi, I'm Tim Kaine, governor of the Commonwealth of Virginia. And there is a better way." R: "What is up with this guy's eyebrow?" GGB: "The government's going to take care of you, we're going to pay for everything, blah dee blah blah blah." Kaine: "There is a better way." GGB: "I feel like I'm watching an informercial. Like he's going to sell us power tools. No, he's not (grunting sound) enough to sell us power tools." GGB: "You didn't vote for this guy, did you?" R: (looking absolutely horrified) "Hell no!" 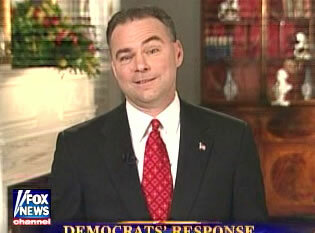 Kaine: "Thereisabetterwaythereisabetterywaythereisabetterway. God bless America." Brit Hume: "Let's go now to our panel and discuss how they go about choosing someone to offer the Democratic response and why they would pick such a person. Mort?" UPDATE: Something else had been bothering me about Kaine, and I finally figured it out. He eerily reminds me of "Larry," a guy I went out with about a year ago who (1) was on lithium, (2) couldn't take no for an answer (especially when I objected to being clumsily felt up on our third date), and (3) HAS THE SAME EYEBROW WEIRDNESS.